We offer scales to meet the needs of industrial and veterinary facilities as well as custom-designed scales to meet the unique needs of all customers. With over thirty years of experience, We have a well-established reputation for manufacturing high-tech, high-quality and affordable scales. Moreover, our American-made scales offer more features than other scales at a fraction of the cost. We saves you money by shipping its merchandise directly from the factory, which eradicates dealer mark-up prices. In addition, by designing and assembling the components necessary to build each scale, We can produce scales to fit all weighing situations. Whether you require high-capacity pallet scales or precise laboratory scales, We can produce scales that specifically meet your needs. We have the ability to produce scales featuring computer software, load cell design and microprocessor instrumentation. We have developed a new technology, called Surface Acoustic Wave, or SAW, that is superior to the two main technologies used to produce scales — strain gage and force restoration. The most commonly used and affordable scales are strain gage, which generally produce a resolution of one part in 5,000. Thus, a scale designed to weigh 50 pounds will produce a resolution of one-hundredth of a pound, and a scale with the capacity to weigh 100 pounds will result in a resolution of two-hundredths of a pound. High-end scales will give a resolution of one part in 10,000. Despite modern innovations and very high resolutions, the accuracy of measurements using strain gage scales has mostly remained unchanged. Strain gage scales primarily use load cells composed of aluminum, which is less expensive and easier to mold into shapes. 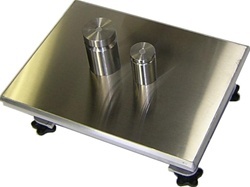 Higher quality scales, such as Our Scales, use stainless steel. Scales made of stainless steel are tougher and tend to last longer than scales made of less expensive metals. Force restoration scales, which use electromagnet force to weigh items, are accurate and offer extremely high resolutions that can range from one in 50,000 to one in 150,000 and higher. These electromagnet scales, however, are very expensive and can cost up to ten times more than strain gage scales. Moreover, this form of technology is more likely to result in errors from unstable temperature environments, more likely to sustain overload damage and is difficult to implement in scales designed to weigh 50 pounds or more. Our patented high-tech SAW scales use high-tech methods that resemble technology used in building semiconductor integrated circuits, which produces a superior digital output that ranges from one part in 100,000 to one part in 200,000. In addition, SAW scales offer a superior quality temperature control and an outstanding ability to tolerate overload and shock. You can purchase SAW scales that weigh items up to 500 pounds and produce an accuracy that is 20 times better than strain gage scales. Furthermore, SAW scales offer the best technology at a price that is one-third less than that of force restoration scales. Scales use instruments specifically designed to produce the accurate weight of whatever you need to weigh. Electronic scales are even designed to weigh certain items. For instance, large floor scales are created to handle heavy items, including forklifts and tanks. Drum scales and platform scales are designed to weigh a variety of items such as inventory shipments. Counting scales are developed with special characteristics that allow them to accurately count smaller parts or pieces. Moreover, bench scales are designed for mixing product ingredients or for weighing small shipping packages. We provide high-quality scales for all industries. Our standard 6200 industrial bench scales combine strain gauge technology with durable stainless steel load cells to produce a highly accurate and durable scale at a much lower price than other manufacturers. If you are seeking a highly accurate scale, We offer high-resolution scales with super sensitivity and offers regular and large-sized ultra-precision scales with super sensitivity and SAW (Surface Acoustic Wave) technology. Among its many scales, We provide scales for large items, such as corrosion-resistant scales for weighing cylinders and drums of corrosive materials, industrial drum scales with a ramp and stainless steel load cells and provides cylinder scales for cylinders, pails and tanks with a stainless steel platform as well as floor scales with a large graphics LCD digital display. To weigh large items off of the floor, We offer versatile high-capacity hanging crane scales. In addition, We offer counting scales with quick-count mode and, if you need to measure amounts of rainfall, We offer rain gauge scales with high-accuracy and power supply protection. In addition, We offer scales designed to meet your needs and specifications. For instance, Our explosive environment (intrinsically safe) scales have no moving parts and are safe for use in an explosive environment. If you use a wheelchair for mobility, We offer wheelchair scales that are engineered for accuracy, safety and for easy use by you or your caregivers. The wheelchair scale with handrails and fold-up casters for portability features a grab bar, Bluetooth technology and easily read one-inch block digits. If you are a veterinarian, farmer or run a kennel, We offer some of the best scales available to use with animals. To weigh large animals, We offer lightweight, accurate and heavy-duty 320-VET scales that are constructed with an aluminum frame composed of stainless steel heat-treated load cells. It also features a rubber mat to prevent slipping. In addition, this scale has an easily read, digital display of one-inch block numbers and has the capacity to weigh animals up to 500-pound. Each large-animal scale designed especially for livestock, alpaca and llamas gives you the ability to obtain an accurate weight as the animal moves around. For weighing small animals, We have smaller scales, called 620-VET scales, which can weigh animals as small as birds. In addition, if you work with animals of all sizes, We offer a ÒCombo PackageÓ at a reduced price, which consists of both large and small platforms and one graphic display. We will produce custom-designed scales to help solve your particular weighing requirements, including specially made weighing sensors and load cells. For instance, We can produce weighing sensors and tough load cells, composed of stainless steel that can handle weights ranging from two to 20,000 pounds. It has also developed ultra-precision SAW scales that can weigh from two to 500 pounds. We can meet your individual technology needs, as well. Whether you want a scale with an economical digital indicator or a high quality Linux based color touch screen scale controller, We are prepared to fulfill your unique requests. WhatÕs more, you can choose communication devices, including USB, Ethernet, and wireless Ethernet. We create custom-designed weighing equipment and technology to help you control valves, feeders and equipment that can control and monitor ingredient mixtures as well as software that can transfer information to databases and spreadsheets. We have produced many special weighing applications for customers, including custom-weighing kits, which can be incorporated into other equipment such as laundry carts. We have produced control chutes and gates for sorting and weighing livestock that can record and send computer data and has also created devices to weigh multiple bins, which can collect data and send results to many places. If you need to measure and control flow rates, We can design precise sensors that can indicate small weight changes in containers or tanks. Additional devices that can be designed exclusively for you include monitors to help regulate liquefied gas tanks and devices that control the automatic dispensing of liquids. Our highly trained sales staff can answer all of your questions and provide all of the information you need to choose affordable, high-quality scales specifically designed to meet your individual weighing needs. If you have any questions or looking for further information, please do not hesitate to contact us. It is our pleasure to help you.